Sick of playing decks that are of the mainstream meta? Here are some ideas on what other decks you can play to troll your opponent during tourneys. 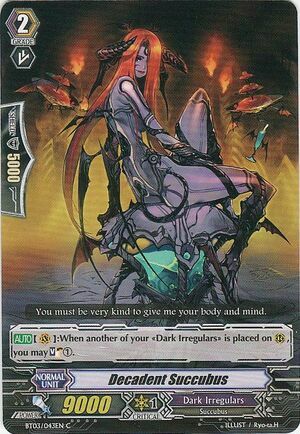 [CONT](VC):If the number of «Dark Irregulars» in your soul is fifteen or more, this unit gets [Critical]+2. 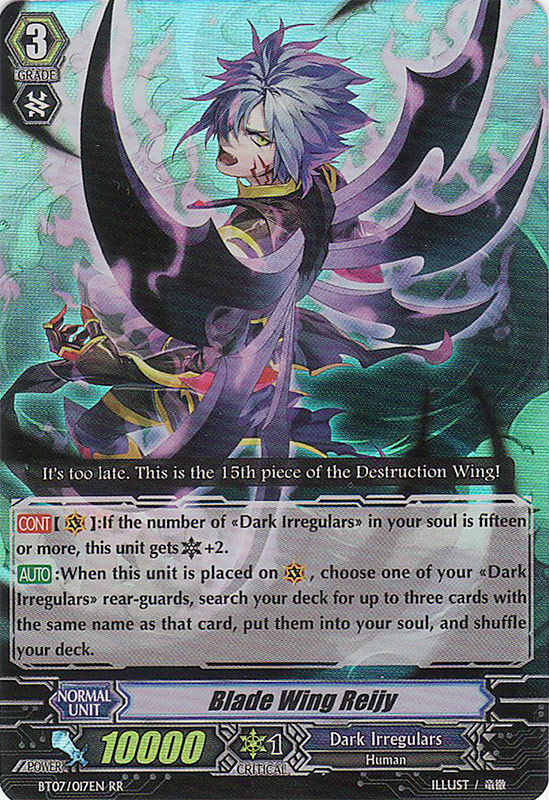 [AUTO]:When this unit is placed on (VC), choose one of your «Dark Irregulars» rear-guards, search your deck for up to three cards with the same name as that card, put them into your soul, and shuffle your deck. This card is indeed the best troll in the format to shut down all limit break decks. Now your opponent would want to wish they have a Limit Break 3 instead. Basically leaving your opponent at 3 damage with this card, automatically shuts down their deck mechanisms and power plays that will screw you up. By leaving at them at 3 damage, not only did it cripple them, but also pressure them to guard this card no matter what. This will also save you from the IMBA stunts of the spike brother decks and prevent major plays such as the dragger-dudley combo. Here is a decklist on how this deck is build. How do i get my 15 soul? 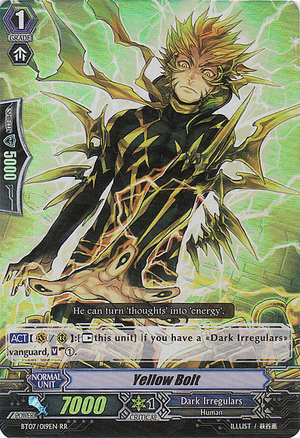 ACT【V/R】: [Rest this unit] If you have a «Dark Irregulars» vanguard, Soul Charge (1). 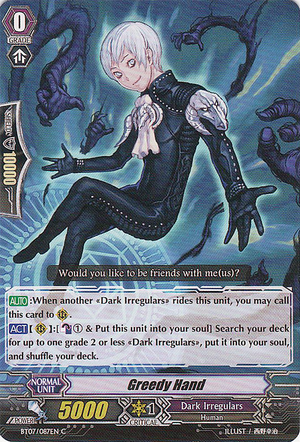 AUTO: When another «Dark Irregulars» rides this unit, you may call this card to Rear-guard Circle. ACT【R】: [Counter Blast (1) & Put this unit into your soul] Search your deck for up to one grade 2 or less «Dark Irregulars», put it into your soul, and shuffle your deck. Meaning, you ride yellow bolt, greedy hand move to rearguard. Use Greedy hand effect to move him to soul and put a grade 2 or below to soul. 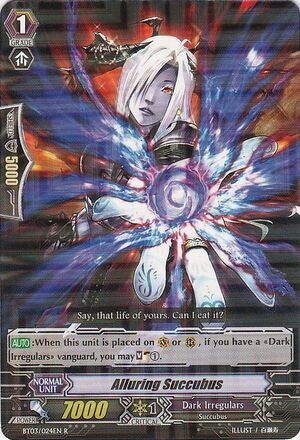 AUTO【V】: When another of your «Dark Irregulars» is placed on Rear-guard Circle, you may Soul Charge (1). 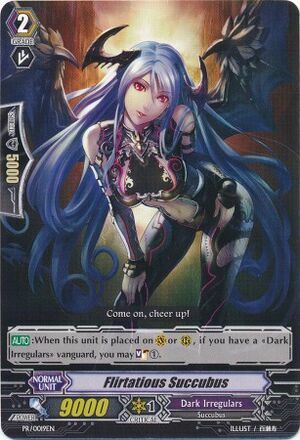 Ride her as a vanguard on turn 2, call Alluring succubus and Flirtatious Succubus for a +2 soul each. Call demon bike behind vanguard. Attack opponent vanguard with emblem master, boosted with Alluring Succubus. Use counterblast when attack hit vanguard. Use reijy effect to soul charge 3 demon bike. Soul size 14 ~ 17. Minimum soul size should be around 12~14 under worse case scenario. Trolling begins at turn 4 onwards.